How Long Should I Keep My Backups? - Ask Leo! Having a regular backup in place is critical - but then what? I'll look at how long you might want to keep those backups, why, and how long I keep my backups. Whenever I back up my computer, how long should I keep my backups? I have some from years ago, and I want to delete them. The answer depends on the reason you made a backup in the first place. Let’s look at some of the reasons, and the implication of each on what’s more formally called “data retention”. Safety net – backups taken specifically to protect yourself when taking a risky action. Regular – backups you take automatically on a periodic schedule. Archive – backups intended to be kept as a long-term archive. Some backups are made simply as a safety net prior to some risky event. In case something goes wrong, you can restore your system to its status before that risky action. For example, you might back up your registry prior to installing software you don’t completely trust. Another example might be a system-image backup of your entire computer, taken just before upgrading the operating system. These types of backups are often temporary. Once the risk has passed, and you’re certain you’ll never have to revert to that backup, there’s no need to keep it. That could be moments, hours, days, or weeks, depending on what it takes to feel confident that you’ll never need to revert. Typically, it’s closer to days than weeks. I consider regularly scheduled backups to be the most important way to protect yourself from data loss. My general recommendation is to use backup software to automate a monthly full-image backup of your machine with intervening daily incremental backups. The specifics – monthly and daily – are less important than actually having something that happens automatically, with no need for you to remember and take action. There’s no set answer as to how long you should keep these, as it really depends on your own configuration, needs, and storage capacity. You might discard backups older than a month, or perhaps a year. You might decide to keep specific snapshots for longer, “just in case”, but discard the majority. I keep daily incremental backups for a month, until the next full backup occurs. I keep monthly full backup images for at least three months. I keep the full backup images for each quarter for an additional year. I want to mention one additional type of backup that many might not consider to be a backup at all: what I call an archive. An archive, to me, is a collection of data is intended to be kept forever, even though it’s not necessarily needed now, or needed daily. For example, those backups that I keep “pretty much forever”, above, might be considered archive copies of the long-defunct machines they represent. Similarly, the fact that I copy my photographs to cloud storage, in addition to backing them up locally, might also be considered archival. The concept of archiving is truly data-dependent. There’s no need to archive your operating system updates for posterity, but your correspondence, photographs, and other more personal items might be appropriate for archival. Then keep it a while longer. Before answering that, we also need to look at what’s been backed up, and what the implications of “needing it again” might be. A complete system restore to a backup image resets everything on that machine to the condition it was in on the day the backup was taken. Everything since the time that backup was made is lost. For example, perhaps on September 1, I restore my computer to a full image backup that was taken on June 1. All changes between June 1 and September 1 (that haven’t been saved elsewhere) are lost. As you can imagine, then, while I might very well restore to an image of a few days ago because of a system failure or other catastrophic event, I certainly won’t be restoring my system to the image taken on January 1 two years ago. Those images are valuable because of the files they contain. While I might never completely restore my entire machine to their contents, I can still use my back-up software to explore and restore specific files from the backups taken on those earlier dates. And because they’re image backups – backups of absolutely everything – I know that anything on the machine at that time can be recovered. Can I just keep making incremental backups after I’ve made a full image backup? - Incremental backups, in a practical sense, have a limited shelf life. I'll explain why a full backup once a month is just about right. 1: In reality, “forever” often turns out to be about five or ten years. Every so often, I go into a clean-up frenzy and delete individual backups I’m confident will never, ever be needed. Hello, Leo. I’m a 75-year old computer newbie …not really a “newbie” at my age, but a novice computer user nonetheless. I use a system called “Registry Booster” to “clean up” my registry …. I don’t know why I need to do this, but do it anyway. I only use this laptop for emailing to my kids and friends, for my Blockbuster account, to order online crap I don’t really need, to research stuff for crossword puzzles, “streaming” music sites and for online banking purposes. So, nothing really complicated or technical involved. So my comment is …..do I really need “backups” and a registry cleaner? If I don’t need backups and they’re taking up space, how can I delete same to allow more computer space? My thoughts on registry cleaners are here: What’s the best registry cleaner? 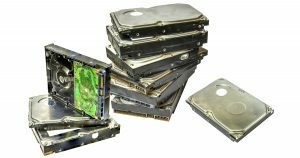 If your computer’s hard disk was suddenly blank and everything on it were permanently lost, would that be a problem? If so, then you definitely need backups. And as that statement implies backups should never be to the same hard disk; they should be to another hard disk. These days that’s typically an external USB drive. I keep around 10 days worth of System Restore points. Sometimes it is the best or only way to uninstall something that didn’t work out. An uninstaller may leave a lot of stuff behind or not work at all. As well as System State and My Docs backups (using the standard Microsoft tools), I use Macrium Reflect to create a ghost image once a week. I don’t make that many changes, so I find that keeping My Docs, System State, and a ghost image dating back two weeks is suitable for me. I also use Puppy Linux as a back up OS, so I can retreive .pst files and anything else I might need before restoring from a source that I might have made two days ago, but is never more than two weeks old. I use the third party product from Symantec: BESR (Backup Exec System Restore) which takes full drive images or can be setup to schedule full & incremental / differential backups and from that you recover your system in it’s entirety or portions that may get damaged from disk failure file corruption etc. I find I need to clear out backups more often because the 2 TB drives fill up so fast (weekly full / daily incremental). Also, I just learned a lesson – Don’t forget to look at your backups once in awhile. I thought I had set up Macrium Reflect to backup my D drive as well as C when creating an image backup, but ooops, it wasn’t backing up D for weeks, about the time I upgraded to Windows 10. Luckily, I noticed it before something bad happened. I’ve reported here and there a few times about the time I discovered corrupted files on the external disk that holds my working files. Then I discovered I had been backing up dozens of corrupted files for several months. I’ve been keeping backups for almost a year, limited by the capacity of my five backup disks with near-daily, weekly, and monthly layers. I think I’ll take Leo’s hint and add another disk or two for annual backups. Disks are cheaper than data. I don’t have an off-site place to keep backups. Instead, I keep my two weekly disks in my basement, in a plastic food-storage container. I find the typical 1TB USB disks (Western Digital and Seagate) are too “cheap”. They fail too easily. The accounting company where I work keeps backups forever. At the start of the month, the backup drive is swapped out and taken off-site, and eventually goes to long-term storage. And yes, there have been a few times when a drive (or previously, a tape) was retrieved from long-term storage. Several commenters have mentioned this but I think it needs to be stated explicitly. The article talks about how long you might *want* to keep several types of backups, but its the capacity of your backup media that determines how long you’ll *be able* to. Backing up to DVD or tape is a pain, but it can’t be beat for long-term retention. When you’re out of media you just go to Staples and buy more. But when you’re backing up to disk, you have to consider how many full and incremental backups the disk can hold. 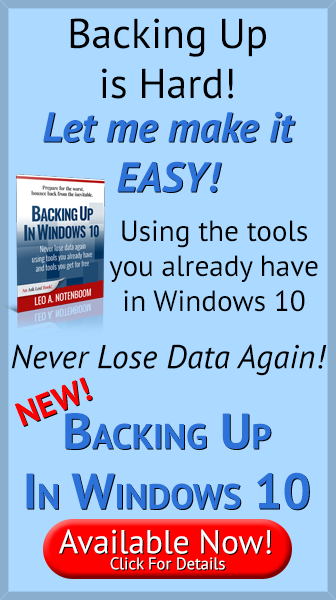 If your backup device holds ten times as much as the disk(s) you’re backing up, that puts an absolute limit of ten on the number of full backups you can keep. Or, depending on your change rate, a smaller number of full backups and some incrementals. A 100 GB system which is probably less than many of the people reading this have would take about 20 DVDs at a cost of about $6.00. 10 of those backup sets will get you a 2TB external hard drive which will hold 20 backups. Less time less cost, a more stable backup, and you can reuse any of the disk space when you determine you no longer need any of those backups. I’d go for the extra drives. Yeah, DVDs really aren’t a good choice for backups for a variety of reasons – not least of which is the fact that DVDs are going the way of the dodo (or should that be going the way of the 5.25″ floppy?). Fewer and fewer devices will ship with DVD drives and, consequently, it’ll become harder and harder to access the data on them. Yes, there is always a small chance I will lose a file if a problem occurs between backups but in all my years of computing this has never happened. In any case, critical personal files (medical/financial) are immediately (for all practical purposes) replicated to another local machine via BitTorrent Sync.